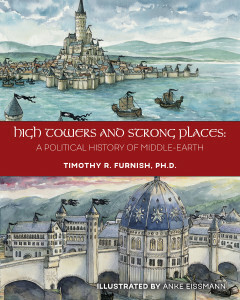 High Towers and Strong Places: A Political History of Middle-earth by Dr. Timothy R. Furnish, PH.D.
“Dr. Timothy R. Furnish applies Primary World analysis—political, cultural, social, and economic— to Middle-earth’s 7,000 years of recorded history in this richly illustrated volume, High Towers and Strong Places. Steering clear of literary criticism, the standard approach to Tolkien for the last six decades, this book instead uses Tolkien’s writings to examine each of the major races of Middle-earth in some detail. It then delves into how each speaking people’s anthropological traits informed the political systems they devised. Middle-earth’s man y states, Beleriand to Barad-dûr and Utumno to Umbar, from First through early Fourth Ages, are compared and contrasted with Primary World examples such as Rome/Byzantium; the Carolingian Empire; and the Islamic caliphates before being classified as monarchies, aristocracies or democracies. High Towers and Strong Places also offers a grander geopolitical analysis, looking at the international relations and balance-of-power politics over millennia of Middle-earth’s history.